RF Safe offers two different styles of premium quality phone cases designed to provide the highest level of protection from potentially dangerous Smartphone radiation. The methodology used for providing the most effective way to reduce excessive phone radiation exposure has not changed. The F-Series (Folio) and G-Series (Graphene) both use a shielded front flip cover design. Another way they are similar is that radiation shielding is never used on the sides or rear of either case to prevent affecting the smartphone’s software regulating RF power output. Putting aside cosmetic differences for a moment. The biggest difference between the F-Series and G-Series phone radiation cases are the materials used to provide RFR shielding. Why change the RF shielding materials? 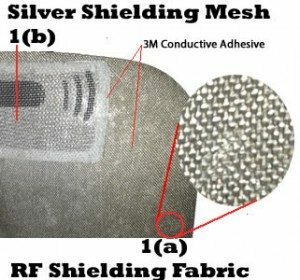 While there is nothing wrong with conventional metal mesh RF shielding technology that RF Safe has used for 20 years. Advancements in materials cannot be ignored when the company’s vision is to make wireless devices as safe as possible. That advancement in materials is graphene, a “wonder material” that has amazing RF shielding qualities among a long list of spectacular attributes thought to be impossible just 10 years ago. In November 2017, RF Safe renamed the world’s best phone radiation case with conventional RF Shielding to an F-Series (Folio). The term “folio”, from the Latin folium (leaf), has a few distinct meanings in the world of books. 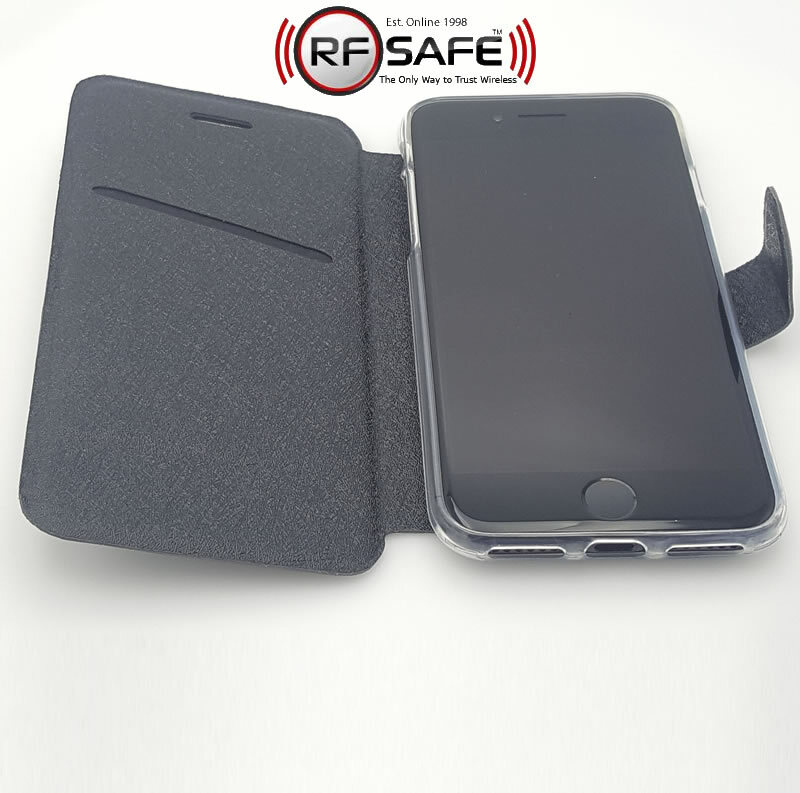 The design of RF Safe’s case is a lot like a book, it has a cover on the front and rear, and you must open it like a book to view the screen. 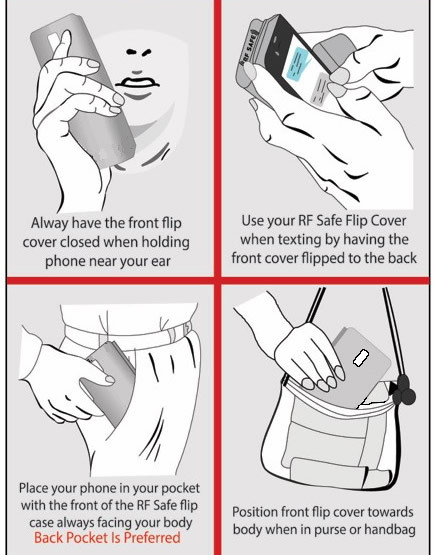 The front cover of RF Safe’s case design is referred to as a shielded flip because the front cover can flip over to the rear when texting etc. In order to differentiate phone cases with conventional RF shielding from the latest graphene-based shielding technology — RF Safe’s legacy case is now called an F-Series (Folio) and RF Safe’s phone case using the latest advancements in material science is referred to as the G-Series (Graphene). RF Safe’s F-Series (Folio) smartphone radiation case is crafted using RF Safe’s conductive mesh radiation shielding coated with heat displacing foam that’s sealed inside PU leather covering the entire front of your Smartphone to provide a protective RF radiation barrier between the smartphone and your body. 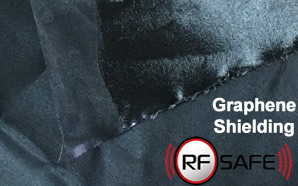 1(a) RF Shielded fabric is made from polyester filaments woven with a blend of micro-fine conductive threads. The shielding fabric is then combined with a proprietary layer of CR foam rubber designed to keep your phones display screen looking like new while deflecting potentially harmful radiation away. 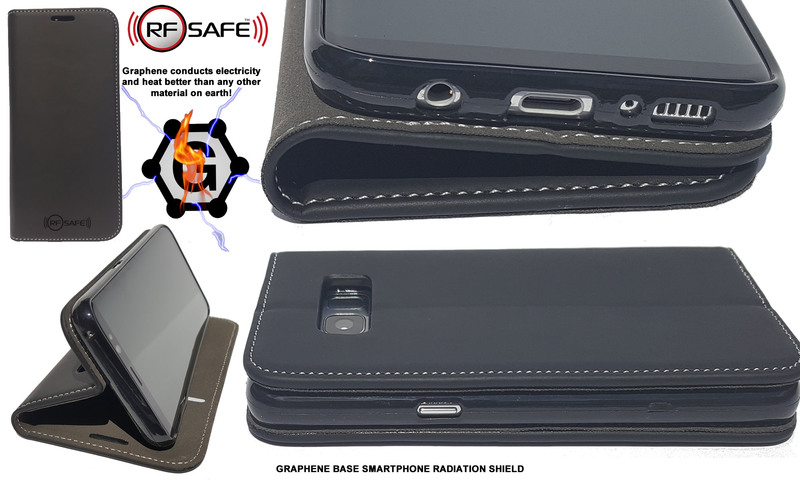 RF Safe is the world’s first company to offer graphene-based shielding technology built into a phone case to protect against excessive smartphone radiation exposure in the all-new 2017 RF Safe G-Series (Graphene) Smartphone Radiation Shield. This G-Series case uses a convenient RF radiation shielded front flip cover design identical all protective cases manufactured and sold by RF Safe. A significant body of research into graphene demonstrates that carbon nanostructure-based nanocomposite materials can outperform conventional metal shielding due to their light weight, resistance to corrosion, flexibility, and the advantages don’t stop there. On top of all these, graphene’s excellent conductivity makes it perfect for smartphone safety applications when high-performance radiation shielding is needed. The graphene shielding inside the front cover will not interfere with call quality or battery power. When shielding phone radiation from only the front of the phone that is facing your head or body – you are blocking only radiation that the body would have absorbed and that shielded energy wasn’t available for a cell tower because it would have been absorbed into human tissues distributed as heat into the body. 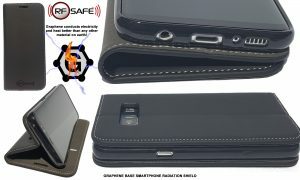 The F-Series (Folio) and G-Series (Graphene) both use a shielded front flip cover design requiring the shielded flip cover remains between the user and wireless device. RF Safe G-Series Cases are a very sophisticated and stylish design with a built-in convertible kick-stand to meet your highest viewing expectations. Meticulously designed using high-quality leather with a built-in magnetic closing mechanism that easily keeps the RF shielded front cover secured. Next article Cancer expert says science merits need to reclassify phone radiation as a "Group 1 carcinogenic to humans"